Today I want to show you how you can turn an ordinary flower stamp into something extraordinary! 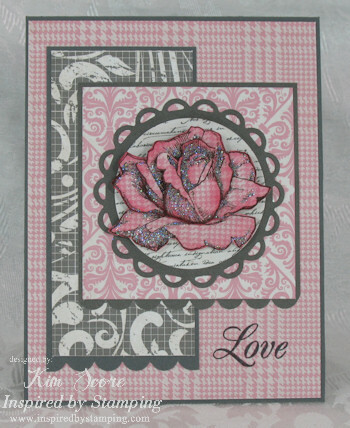 Recently, Inspired by Stamping came out with a new set called Elegant Flowers. 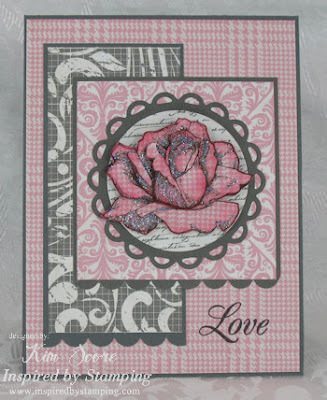 I instantly knew I could use this special technique on the rose stamp in that set. I call this technique the 3-D layered look simply because the image appears to pop off the page by layering several pieces of the same image. 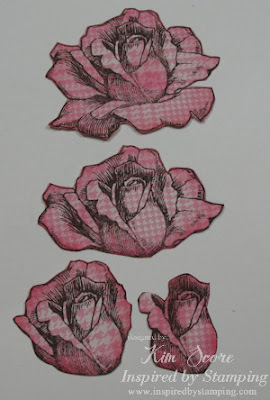 Stamp rose with Early Espresso ink on houndstooth paper FOUR times. Cut out the flowers as shown below. On three of the flowers, some of the flower petals will be missing. 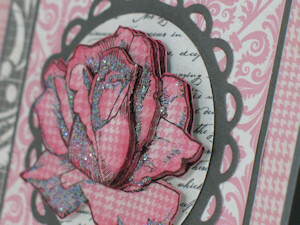 Sponge the edges of flower pieces with Regal Rose ink. Starting with the full flower at the bottom, attach the next largest layer on top of full flower with dimensional, aligning image. Attach second largest flower with dimensional and then smallest layer with dimensional. To add more glitz, you can apply glitter to the shaded areas of the flower petals. Oh how gorgeous!! thanks so much for sharing your amazing talent with us. Beautiful, beautiful! I am not one good at cutting but would be willing to give this a try. The whole card is wonderful and love the pink paper. 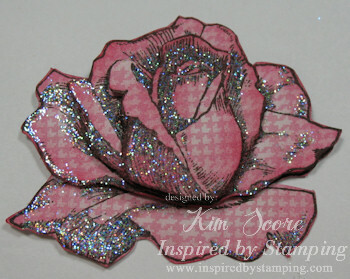 And the glitter really makes the rose pop! TFS! Love this idea Kim and thanks so much for breaking it down a bit. Will def have a go. The glitter adds the final perfect touch to the pretty flower. Thanks for the tutorial. I love the whole layout! Beautiful stamp that is perfect for this paper tole technique. Thanks for the link to the stamp company. Nice work!